The new Mercedes-Benz GLC F-CELL will be presented in 2017 and features a new generation of cylinders (Type 4). Hexagon Composites' subsidiary Hexagon Lincoln has been selected by Daimler to supply compressed hydrogen gas (CHG) cylinders for the car manufacturer’s next generation fuel cell electric vehicle. The new Mercedes-Benz GLC F-CELL will be presented in 2017 and features a new generation of cylinders (Type 4). Type 4 cylinders are suitable for hydrogen applications because they can work in extreme pressure, temperature and fatigue situations. CHG is stored at 700 bar/10,000 psi, reportedly the best pressure for hydrogen use. 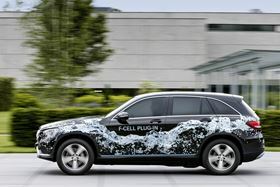 The GLC F-CELL range is about 500 km/310 miles (NEDC) and can be refilled in about three minutes – the same time as a conventional combustion vehicle. This story is reprinted from material from Hexagon, with editorial changes made by Materials Today. The views expressed in this article do not necessarily represent those of Elsevier. Lanxess has provided a range of polyamides reinforced with a high glass fiber content to replace metal in two air filter carriers. Mercedes-Benz Trucks says that it has made its first additive manufactured (AM) spare part made of metal, a thermostat cover for truck and Unimog models.